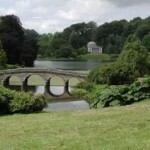 NORFOLK – watery wilderness, wildlife wonderlands and ancient history. Descend by ladder into those times past at Grimes Graves – hundreds of flint mines dating back 4,000 years. Then, on to Norwich, one of the best-preserved medieval cities in Britain. 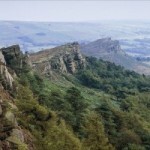 It is dominated by the magnificent cathedral and its 315 ft spire – the second tallest in England, after Salisbury. The Norfolk Broads is still a place of mystery and enchantment. Joined by six rivers, the broads are flooded medieval peat diggings. Great boating and a wildlife treasure house. The sea rules the roost on the north Norfolk coast – an Area of Outstanding Natural Beauty – where shingle and sand banks, such as Blakeney Point, protect vast reedland marshes and many nature and bird reserves, including Cley. The Palladian masterpiece, Holkham Hall, houses great art; the Jacobean Blickling Hall is one of England’s finest and the Queen’s country retreat, Sandringham, is classic Edwardian. 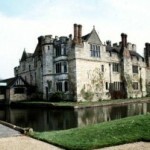 Stroll through stunning gardens at Bressingham, Oxburgh Hall and Pensthorpe, where there is also a waterfowl park. Banham Zoo is a grand family day out. 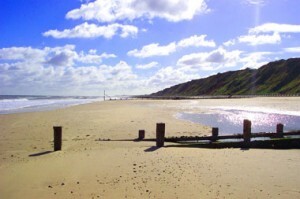 Running nearly 100 miles, the Peddars Way and Norfolk Coast Path National Trail shows off Norfolk’s superb landscapes. And raise a glass to Admiral Lord Nelson at his birthplace, in Burnham Thorpe, before visiting Nelson’s Column, at Great Yarmouth, and enjoying a spin on the town’s famous Pleasure Beach. 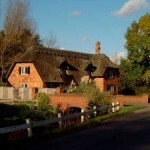 Our website is home to a plethora of Norfolk B&B’s. Click on the town name to see what Norfolk Bed and Breakfasts are available in that area, or the information link to gain additional information for each individual area.